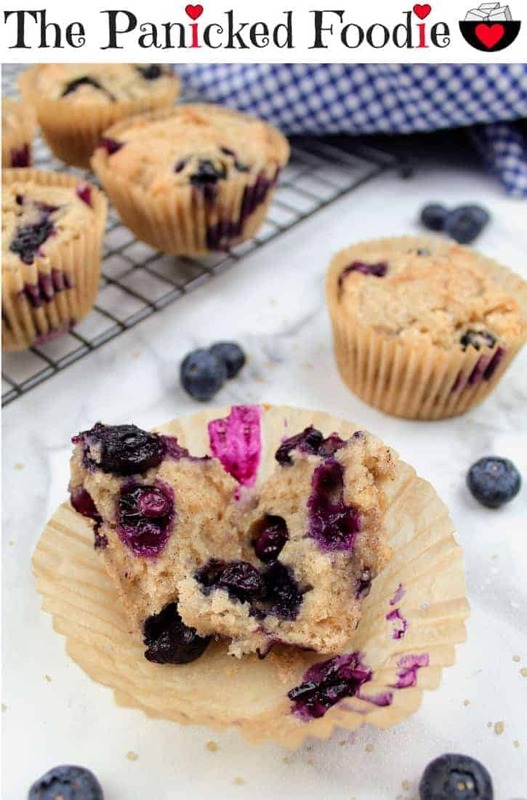 These vegan blueberry muffins have been a loonngggg time coming. While blueberry muffins are my favorite muffin, I made them for the very first time a few months ago. Ever since my muffin disaster back in 2016, I’ve been hesitant to try again. After successfully making my vegan chocolate cupcakes and now these a few times, I can safely say that I am no longer nervous about it. 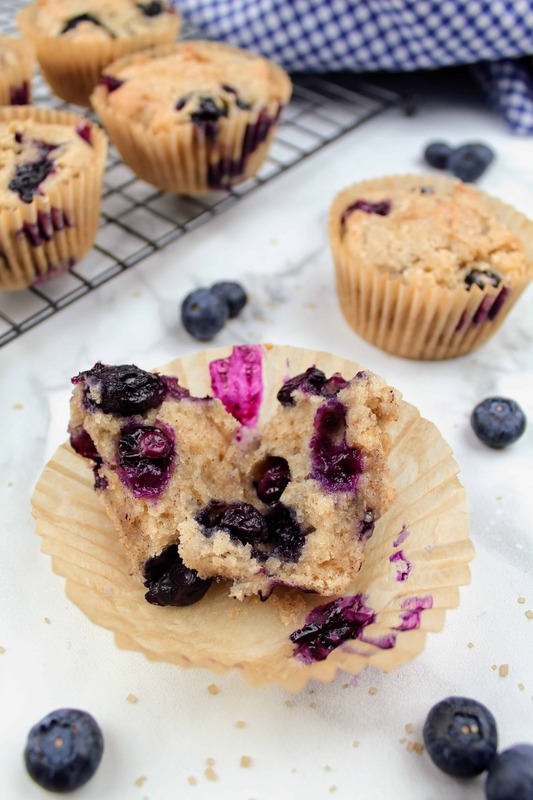 Now…about how great these vegan blueberry muffins are. My step-dad and mother were out and about doing errands, and I asked if they wanted to stop over and try my muffins. They’ve always given me the side eye when I ask them if they want to try my food, especially if there are words like vegan, dairy-free, or gluten-free in the name. They also press me pretty hard on the ingredients haha. 🙂 My mom avoids carbs, so no star rating from her, but my step-dad tried them and said they were good. He asked if he could have a second one! 🙂 In addition to being vegan, these muffins are also gluten-free. If you aren’t gluten-free, you can easily use regular all-purpose flour 1:1 in place of the gluten-free flour. Texture-wise, these muffins have a moist interior, with a golden, crusty top adorned with demerara sugar. I had two of them in one sitting, and was tempted to eat a third! I finally had to put them in the freezer so that I couldn’t eat any more. I love making these muffins on the weekend and pairing them with a golden milk latte or a vegan hot cocoa. Ahhhh, so relaxing! 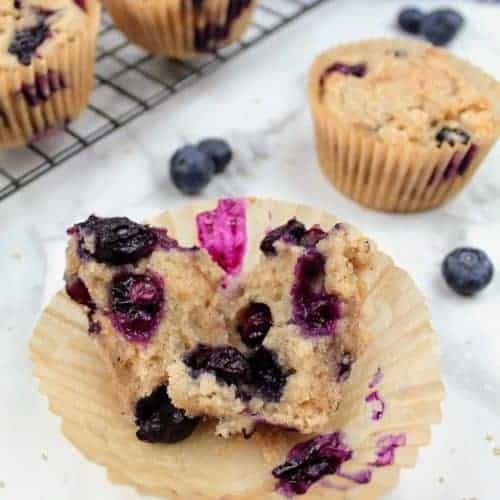 Can I use frozen blueberries in muffins? Absolutely! This is how I almost always make mine, because the blueberry growing season where I am is pretty short. And blueberries are generally pretty expensive in the off season, unless I can catch them on sale at Aldi’s. And actually in the photos below, you will see that I used a mixture of fresh and frozen blueberries. You can use all fresh, all frozen, or some combination thereof. It doesn’t really matter! 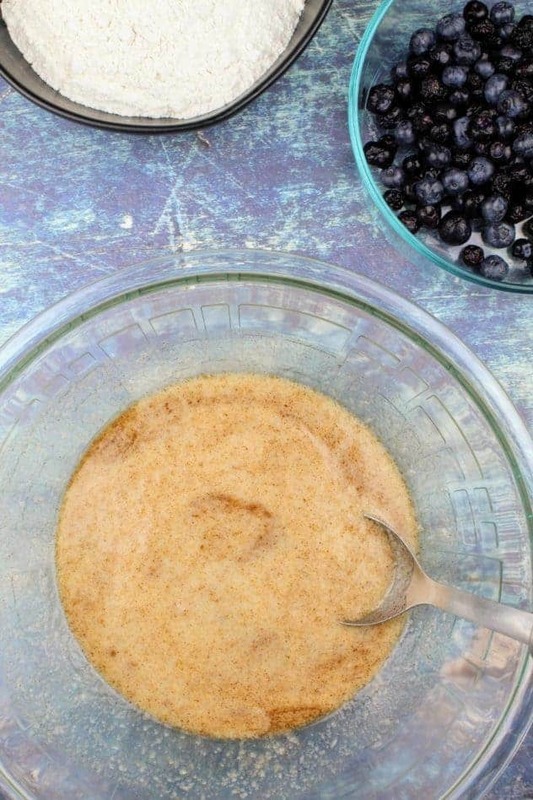 There is an extra step or two when working with frozen blueberries in your batter which I will cover below. What do I use to line my muffin pan? Before we get into the different options, I just want to emphasize that what you use to line your muffin tin can make or break your muffins (or cupcakes). In my experience, the cheaper the paper cupcake liner the worse they stick to the muffin. I’ve tried peeling off the paper liner when they are warm, when they are cold, and it is a disaster no matter the temperature of the muffin. The liner I have had the best luck with, is the ‘If You Care’ brand. But these can be really hard to find, so I am on the hunt for another option. The one I am looking to try next, is the PaperChef baking parchment cups because they got really great reviews. Other options include foil and the reusable silicon. I haven’t tried either of these options yet. I’m hesitant on the silicon because silicon can smell quite nasty when baking. Also, I don’t think I am up to the task of washing 12 individual liners along with the muffin pan. Another great option is to use no liner at all. I’ve experimented with this a little bit, and have found that the muffins come out quite easily if the cup is greased correctly. I grease mine with crisco vegetable shortening. The one thing to watch out for here though, is when baking muffins with fruits or vegetables. They can sometimes get adhered to the sides of the cup. The muffin pan will require some extra soaking in order to get this off. 1. Preheat oven to 400F and prepare your muffin tin. 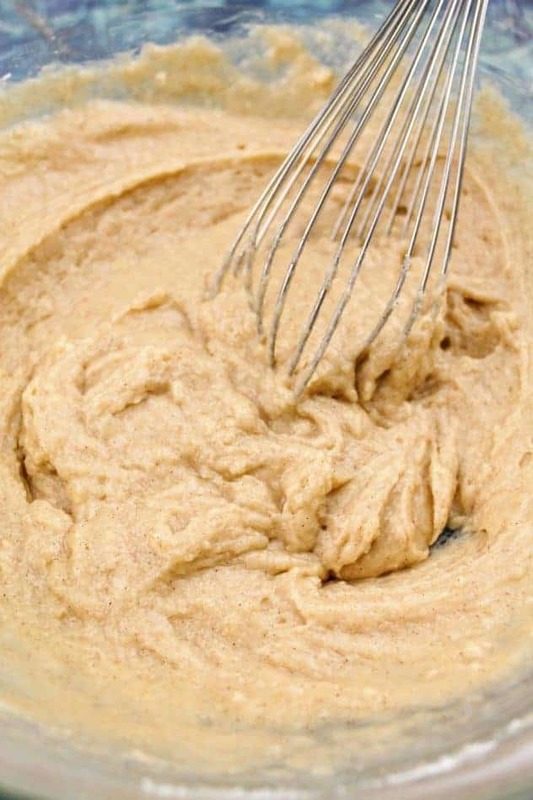 In a large mixing bowl, blend together the baking powder, kosher salt, melted vegan butter, extra light olive oil, granulated sugar, applesauce, almond milk, and ground cinnamon. 2. Add flour to the mixture one cup at a time, combining after each addition. 3. 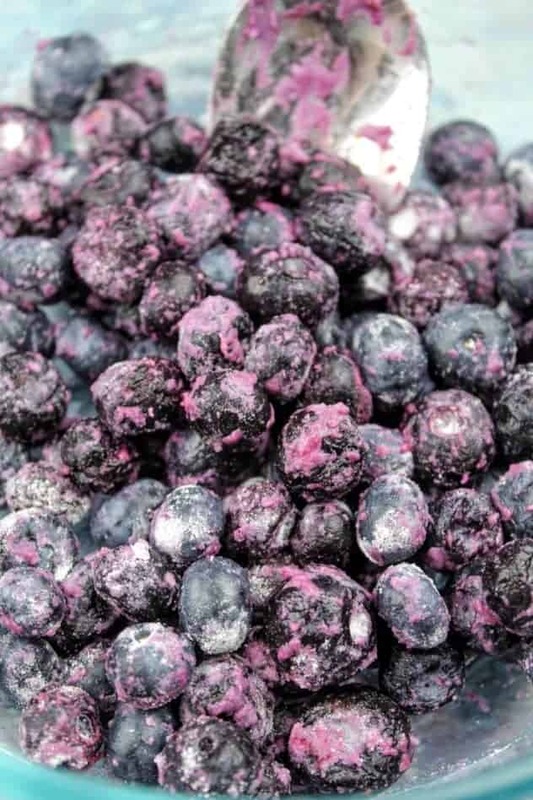 When working with frozen blueberries, make sure to rinse them until the water runs clear. You want to get rid of as much dye as possible, otherwise there could be staining and also your muffins might come out on the tie-dye side (see my batter below!). You won’t have this issue with fresh blueberries, so rinse them as you normally would. Regardless of whether you are working with fresh or frozen blueberries, be sure to pat them dry with paper towels. After they are dry, toss them with a little bit of flour to coat them evenly. This helps to keep them suspended in the batter. Then go ahead and the blueberries into the batter. 4. When filling your muffin cups, it is very important to not overfill them. I’ve done this before, and you will get a large mess that will take a while to clean up! For a standard 12 cup muffin pan, I generally use 1/3 cup of batter for each liner. Using a measuring cup, fill each cup. If you want a course sugar topping, feel free to top with either turbinado or demerara sugar. Both are great finishing sugars. 5. Before placing muffin pan in the oven, reduce heat to 375F. Place muffin pan in the oven and bake for 30-35 minutes, or until a toothpick inserted in the center of your center-most cupcake comes out clean. The tops will also be golden and firm. Muffins are one of my favorite foods to make on the weekends. Serve with a cup of golden milk latte, tea, or hot cocoa! 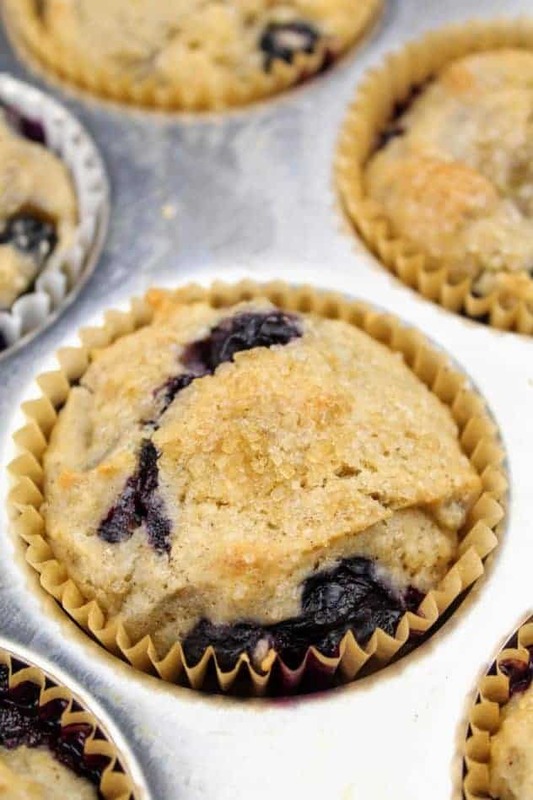 If there are leftovers, these vegan blueberry muffins also freeze really well! Preheat oven to 400F and prepare muffin tin. In a large mixing bowl, blend together baking powder, kosher salt, melted vegan butter, extra light olive oil, granulated sugar, applesauce, almond milk, and ground cinnamon. Add flour to the mixture one cup at a time, combining after each addition. Lightly coat blueberries with flour. 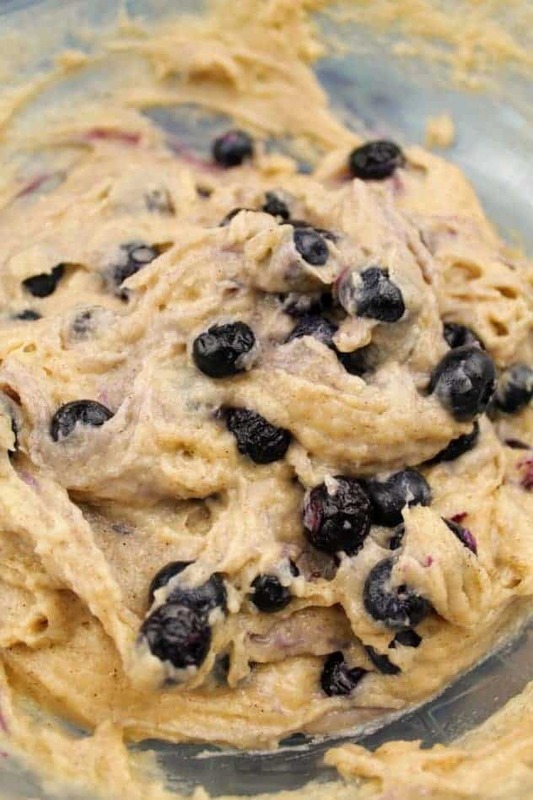 Fold blueberries into the batter. 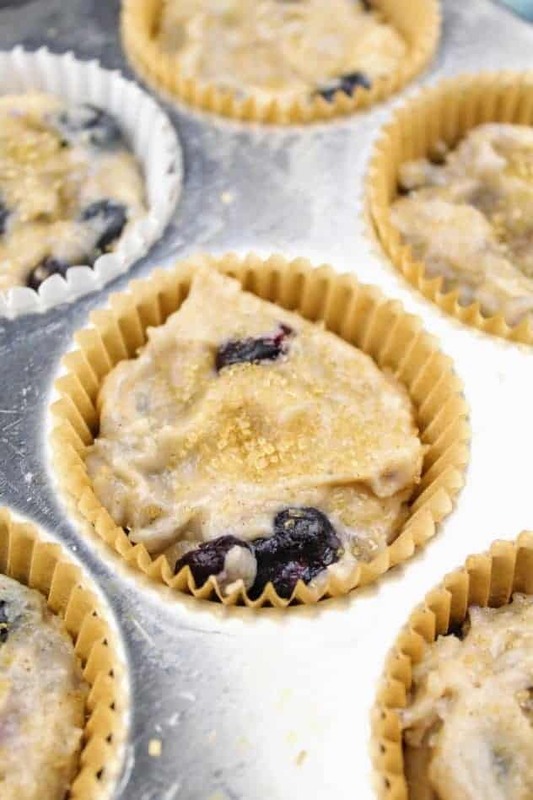 Use a 1/3 measuring cup to measure out batter and pour into muffin cup. Top with a coarse sugar (e.g., demerara or turbinado) if desired. Reduce oven to 375F. Place muffin pan in oven and bake for 30-35 minutes, or until a toothpick inserted in the center comes out clean. The tops should also be golden and firm. Remove pan from oven, and let muffins cool for about 10 minutes before removing. To freeze: Put in a labeled freezer bag and place in the freezer. OMG! İ will definitely try this out. It looks amazing! I absolutely love blueberry muffins. YUM! !